Bed bugs have recently emerged as one of the most annoying insects in many homesteads in Canada. They are not only good at ruining people’s sleep but also they have the potential to harm your health. This is why you need to look for bed bug treatment the moment you spot them in your house. But this can only be achieved effectively if you get the assistance of bed bug pest control experts. Early detection of bed bug infestation is the key to containing further infestation and the spread of the bugs in the house. The good news is that it is easy to identify when the infestation is just beginning so that you get a bed bug exterminator in good time. Presence of mosquito like bites in your body. Physically seeing the bugs or their eggs on your bedding, bed, couches, walls etc. Noticing the above and failing to do something can lead to further infestation which might make it difficult to conduct a thorough bed bug pest control in the house. But with our services coupled with the skills and expertise we posses, it will not be any problem to get rid of the bugs no matter where they try to hide. For the past two decades, we have been offering bed bug treatment and extermination services in Ontario and this has made us acquire a lot of knowledge in the whole process of extermination. That is why we are the people to go to should your realize that you have a bed bug infestation. Therefore, don’t voluntarily subject yourself to the stigma or mental torture that comes with the knowledge that you have bedbugs in your house. 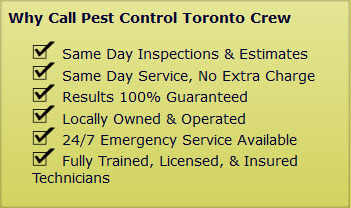 Look for the assistance of bed bug terminators from the Pest Control Toronto Crew and we will be willing to help you get rid of the annoying insects. We proudly service Ajax, Brampton, Burlington, Etobicoke, Maple, Markham, Milton, Mississauga, North York, Oakville, Oshawa, Pickering, Richmond Hill, Scarborough, Whitby, Woodbridge and Thornhill. 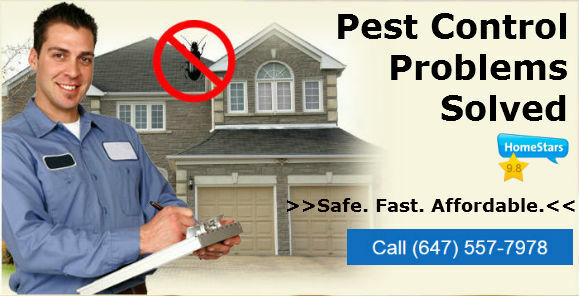 Bed Bug Treatment and Extermination in Toronto, ON call (647) 557-7978.